Tornado path map. Map by Paul Cigan & Benjaman Garret. An EF3 tornado swept through northwest Wisconsin from southeast Polk County to southwest Price County on May 16, leveling many structures and whole forest stands, in what the National Weather Service has declared the longest tornado path on state record. Based on aerial damage surveys by the WI DNR Forest Health Program, the path of mapped storm damage is roughly 70 miles long, up to 2 miles wide, and covers approximately 21,000 forested acres. 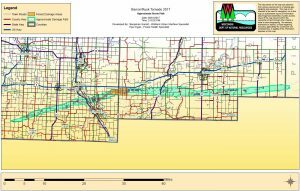 A notable amount of forest blowdown and broken tree stems occurred in the towns of Chetek, Grant, Grow, Prairie Lake, Strickland, Stubbs, and Sumner. Damage primarily affected private lands, including numerous MFL holdings, with limited damage mapped on the Barron County Forest. State lands were largely not impacted. Blowndown stand, from air. Photo by Paul Cigan. second priority: trees with less than 50% of their branches broken or destroyed, trees that have uprooted relatively intact pulling the whole root plate with them, and trees with a few small wounds (<50 inches square). Take the time to consider all your options and consult a professional forester for advice regarding any questions on timber sales. 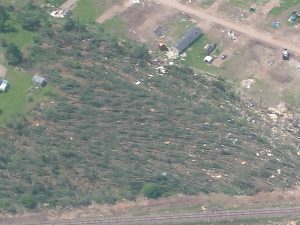 More resources for landowners and foresters affected by the May 16 tornado can be found on the DNR website.